If you’re planning your first bonefish adventure it’s really important that you stock your saltwater fly box with a well rounded selection of fly patterns. Although bonefish aren’t known for being super selective feeders, stocking the right flies and knowing which pattern to fish in different situations can make a big difference in your success on the water. By far the most important element in bonefishing is fly presentation. Without that, you’re going to miss a lot of shots. Putting that aspect aside with the notion that you understand basic bonefish presentation, let’s talk about some tips for purchasing and tying bonefish flies for your upcoming bonefish trip. Because the mouths of bonefish are located on the bottom of the head and they generally feed down on their prey in most cases, it’s very important that you purchase or tie bonefish flies that ride hook point up when possible. Fishing flies that ride hook point up can increase your hookup rate when bonefish eat, and it will also help to naturally cut down on your flies from snagging on the bottom during the retrieve. Gaze your eyes into a veterans bonefish fly box and you’ll find that most of the fly patterns are tied hook point up, but walk into a store that sells saltwater fly patterns and you’ll be amazed how many fly patterns aren’t tied this way. When you have the choice to tie or purchase your bonefish flies hook point up, I recommend you do so. Using fly tying materials that have good movement in the water for your bonefish flies is a another way to help you find success. 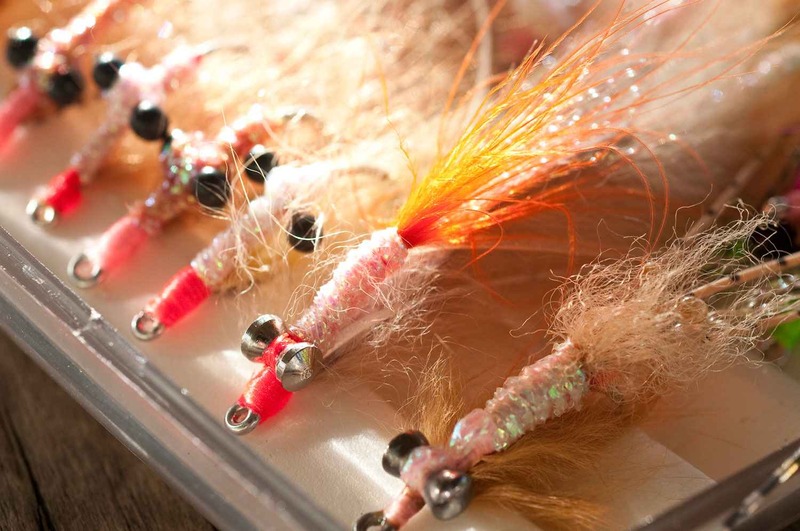 Rabbit strips, marabou, craft fur, and rubber legs are all good examples of tying materials that come to life in the water. I stated before that most bonefish aren’t picky, the key word here is most, but in some situations having a little extra life-like movement in your flies can make a big difference. For instance, a large school of bonefish are going to be less picky on fly pattern choice with competition for food on their minds than a solo bonefish swimming across the flats. Tying or buying bonefish flies that incorporate tying materials that breath well in the water should still provide subtle movement in the water even when you’re not retrieving your flies. All bonefish flats and fishing conditions/situations you’ll encounter in saltwater will not be the same. At times, fishing a bonefish fly that’s weighted correctly and specifically for the water and conditions your fishing can be critical for success. Let’s say you’re fishing an area with a really strong current or water deeper than normal. In this situation, a heavier fly pattern will make it easier for you to quickly get your fly down to the bottom and stay in the strike zone during your retrieve. In the exact opposite conditions, if you’re fishing really shallow water with little current, it could be a much better choice to go with a lighter weighted fly. Many times when bonefishing you can go with a fly pattern that’s falls somewhere in the middle, and be good the entire day of fishing. Just keep in mind that there are times when the weight of your fly should be considered heavily in fly choice. On a side note, when fishing a soft substrate bottom for bonefish a heavier fly can grab the attention of bonefish from the silt puffs the fly makes from bouncing on the bottom. For whatever reason, there always seems to be one fly pattern that will be hot and out fish everything else in your fly box. When you find a hot fly pattern that’s working, you don’t want to worry about running out of it on the water. That’s why I recommend it’s always better to have more of each pattern, rather than a bunch of ones and twos of different fly patterns. Take the time to research what’s the most consistent fly patterns for the location you’ll be fishing, and make sure you have at least a dozen of each in your fly box. When you’re traveling abroad to saltwater locations, it’s standard practice that the angler assumes he/she will provide their own flies. Dont’ expect your guide to provide you with the flies you’ll need. I’ve been on remote trips where the guide didn’t even have a fly box in the boat. Some lodges don’t even sell flies, so if you run out of key fly patterns during the trip, you’re only other option will be begging and bartering flies from the other anglers in your group. 1. Tying in mono weed guards for your bonefish flies is never a bad idea. It’s not mandatory, but in some locations where there’s lots of debris or grass it can keep very helpful. 2. Only quality saltwater hooks should be used in tying and purchasing bonefish flies. The hook is the the most important connection between fish and angler, and skimping money on this part of your equipment is a rookie mistake that can lead to lost fish. This entry was posted in Fly Fishing Tips & Technique, Fly Tying, Saltwater Fly Fishing and tagged 4 Tips For Stocking Bonefish Flies, bonefish flies, bonefish fly patterns, fly fishing blog, fly fishing bonefish, fly fishing flies, Gink & Gasoline, Gink and Gasoline, Kent Klewein, Louis Cahill, Saltwater Fly Fishing by Louis Cahill. Bookmark the permalink. Great tips. Regarding Tip #1, this was my sad surprise on my first bonefish trip. Small and medium bead chain eyes will not make the hook point ride consistently upright. My flies with small bead chain eyes flopped on their side in the sand despite the advice in bonefish fly books suggesting you can put any size eye on the fly you desire. Just not true. I came back home and started weighing eyes. Medium bead chain eyes weight .16 grams each. Micro lead eyes weighs .24 grams and a mini lead eyes .32 grams. I then got really geeky and filmed the flies bottom “stance” in a pool. 10b fluro tippet with a loop knot and flies tied on #4 TMC 811S. Dropped on the leader to 24″ deep. Results: Small bead chain eyes, useless. medium eyes work sometimes depending upon the tie style, large bead chain eyes work almost all the time. Often with medium bead chain, the initial stance may be hook up but after a strip or two it will flop on its side. It still catches fish on its side, just hooks more flats junk. So I stopped using bead chain and started using micro lead eyes on flies for spooky shallow water fish. I did not notice that any more fish were spooked and the fly stayed hook point up when stripped. #1 on pressured fish, get weird with your tying. I always seem to do much better fishing with my own original concoctions than on the tried a true patterns. #2 go small. I always seem to get the most attention from very small patterns. It’s hard to remember that when tying for a trip, especially if you’ve been reading about Andros or the Keys, but on pressured fish smaller is DEFINITELY better. I always regret not have more tiny patterns.